Light up the darkness with Zroadz LED Light Bars + Promo! Looking for the best lighting solution for your Jeep, that would make it more functional and efficient? Guys from Zroadz know how to meet the highest requirements with their off-road LED Light Bars! They are packed with cutting-edge CREE LEDs that are rated to run for 50000 hours. These lights are IP67 waterproof and can operate under extreme hot and cold temperatures. Zroadz light bars feature a rock-solid die-cast aluminum housing to provide an ultimate protection against the rigors of the road. Thanks to the unbreakable poly-carbonate lens you can be sure, that your Jeep is ready to tackle any trails, no matter how tough they are. 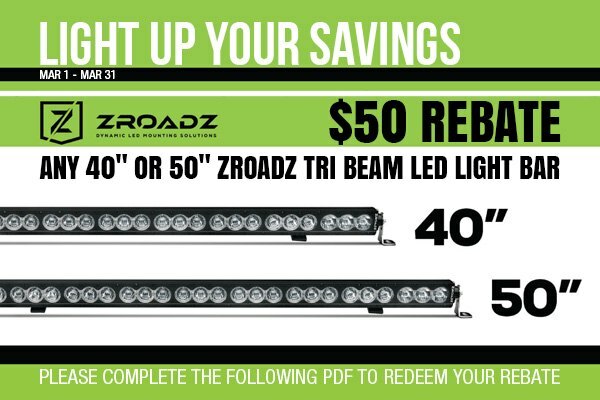 For a limited time receive $50 rebate with any 40" or 50" Zroadz Tri-Beam LED light bar. Don’t hesitate and make your purchase right now. This offer is valid through the end of March 2018. Please complete the following PDF to redeem your rebate. Contact me directly if any questions appear or quote is needed! Make heads turn with your Jeep - choose GenRight Off-Road Products! Quick Reply: Light up the darkness with Zroadz LED Light Bars + Promo!